Tablet users will now be able to read with a two-column view with the latest Kindle app, which allows users to view two pages side-by side when in landscape mode. A new version of the Kindle app for Android has been released by Amazon with a more tablet-friendly user interface. Tablet users will now be able to read with a two-column view with the latest Kindle app, which allows users to view two pages side-by side when in landscape mode. Besides the two-column view, the latest updates also include additional margin and line spacing controls. Other than this, a number of bugs have been fixed, with one in particular which required re-registration when returning to the Kindle app. Apart from these updates, we have the usual free eBooks, built-in dictionary that allows one to tap and hold a word to see its meaning, Google, Wikipedia, eBook Sync which enables one to start reading on one device and pick up where he/she left off on another device, sample eBooks, customized reading and an eBook library from where books can be borrowed. 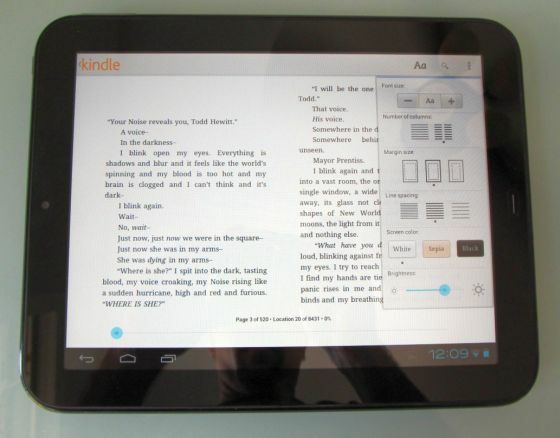 The latest version of Kindle app may not offer the biggest of updates, but users involved with a lot of reading may breathe easier with the latest Kindle app updates.